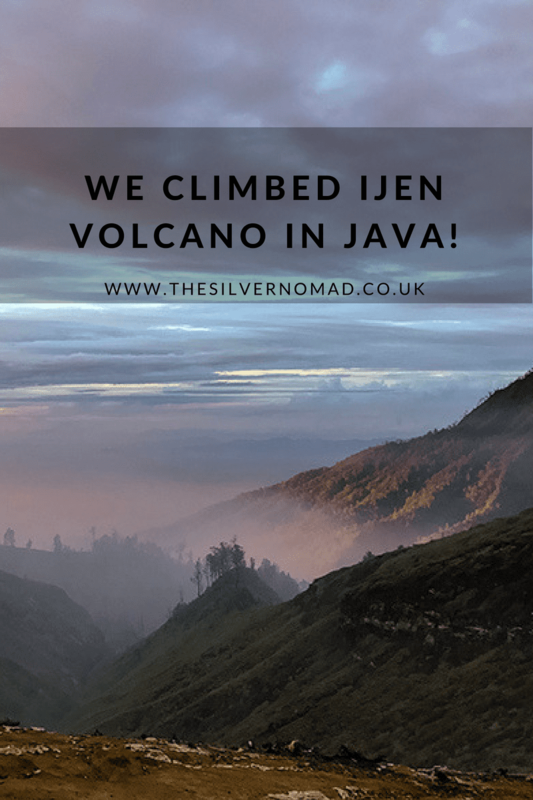 We Climbed Ijen Volcano in Java! 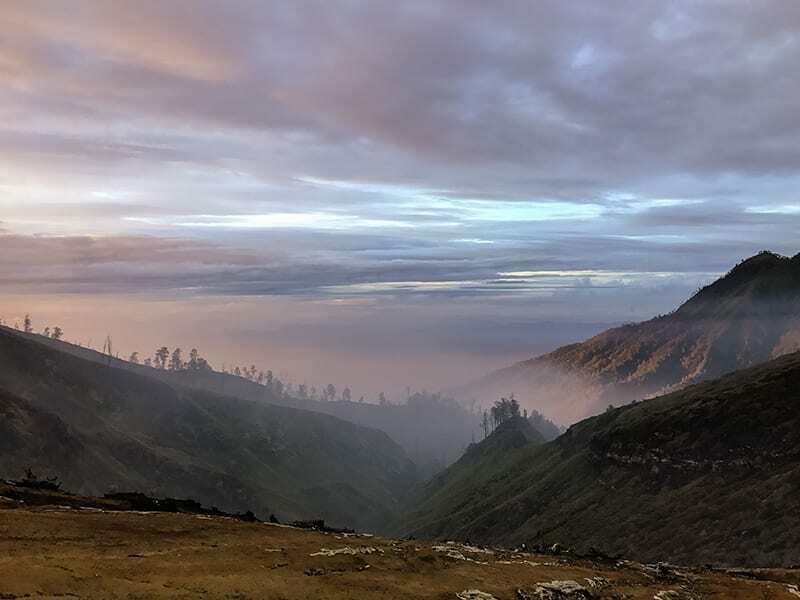 [social_warfare buttons=”Facebook, Twitter, Pinterest”]”Leave at midnight and only a 3km walk to the summit of Ijen Volcano to see the sunrise”, that didn’t sound too bad. 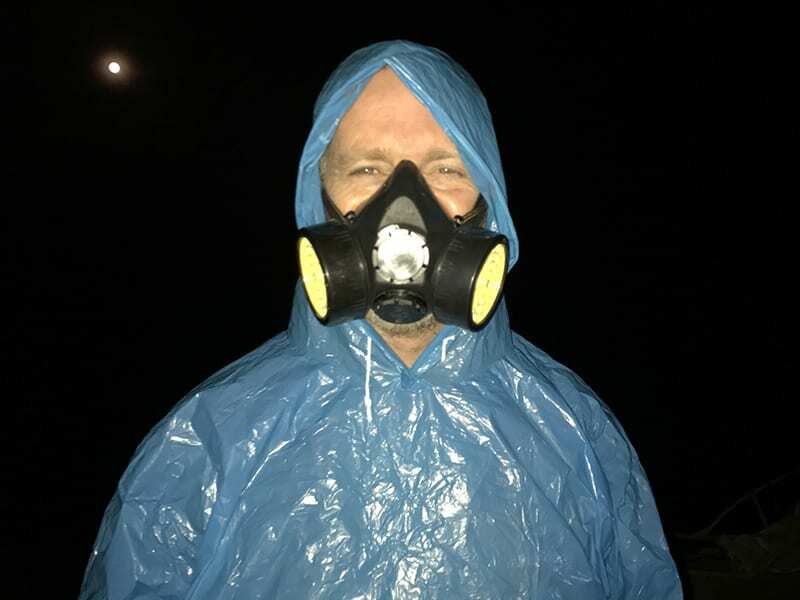 I must admit that I am not the fittest of people, but for some reason, my mind didn’t compute that the walk would be a torchlight winding hike up a dirt track on the side of the volcano! We were on the 7th day of our 3 week trip around Bali on a scooter and had taken the boat from Gilimanuk in the north west of Bali across to Ketapang in Java and were staying at a Didu’s Homestay in Banyuwangi for the night. Our guide, Aruel Harahap, collected us in a minibus just before 12am and we dozed through the hour drive from our homestay to the base of the volcano. Aruel advised us to buy some ‘attractive’ blue waterproof ponchos before we started our trek, to keep us dry and add another layer of warmth. And now it was time for Alan, Aruel and I to climb. It was quite easy to begin with, our torches showing us the way, but within about half-hour, my legs were aching, my breath was a bit laboured and I was ready to rest – what a lightweight! On and on we climbed, passing and being passed by other people eager to get to the top. My mind was so concentrated on walking that I was oblivious to my surroundings. We were offered a lift on the sledges used by the sulphur miners, but pride got the better of me, and I continued. 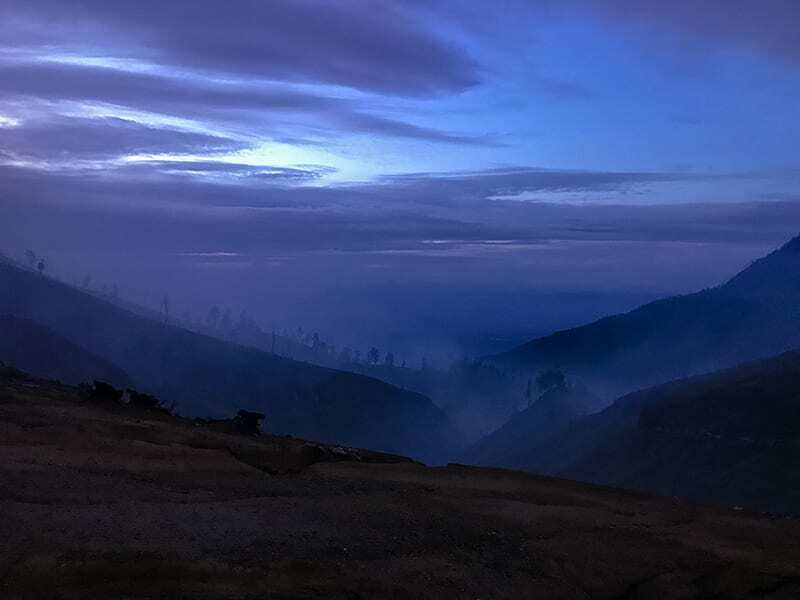 Just as I was about to say (for the 5th, 6th or 10th time), “I can’t go on”, we rounded a corner and there was the crater, looking quite otherworldly in the dark with plumes of steam rising from the turquoise-coloured acid lake a mile down below us. 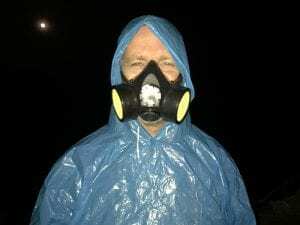 It was still dark, but there were hints that the sun was going to rise soon, so decided to forego the climb down into the crater to see the sulphur mines and the ignited sulphuric gas which gives off amazing blue flames. Alan and Aruel, complete with gas masks made the long trek down into the depths, while I stayed up top. It wasn’t long before the sky started to lighten and the terrain revealed itself. The surrounding area that appeared out of the dawn mist looked more like the surface of the moon than the lush landscape we were used to. Previous eruptions had left their mark, though here and there greenery was poking through. The whole area was breathtakingly beautiful and I was scampering all over the place to take photos. When Alan and Aruel emerged from the crater, we were surrounded by a local college group who wanted their photo taken with us; we rather stand out in our blue ponchos! We started the journey back down the volcano as the sun started warming up, and were asked many times to have our photos taken! 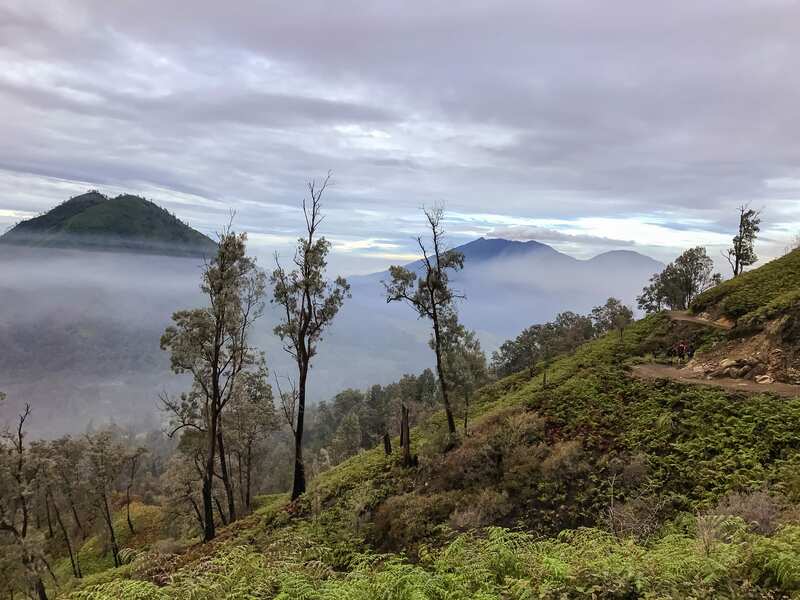 It was amazing to see the narrowness of the route that we had toiled up and how green it was with pockets of ferns and the odd patch of bright orange nasturtiums. The hike up took about 3 hours but the amble back down was a gentle hour. 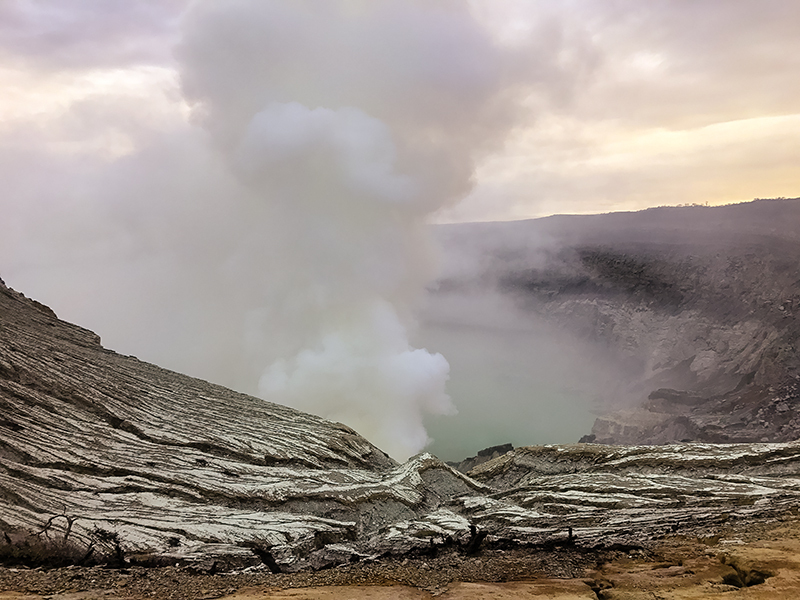 Ijen, is about 9,000ft at its highest point and last erupted in 1999, though smaller ash clouds have been seen since. This last eruption has left behind it the largest highly acidic crater lake in the world which is a beautiful turquoise and produces ideal condition for sulphur to form on the sides of the crater. 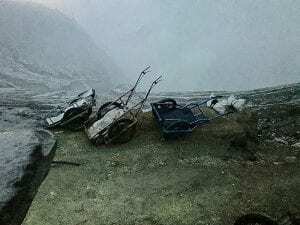 In the early hours, the sulphur miners climb the volcano with their empty sledges. 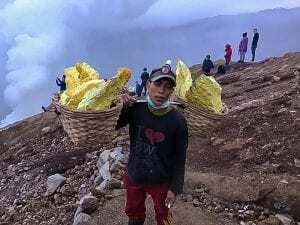 With only rags to cover their mouths to protect them from the toxic fumes, they descend a mile down into the crater itself to hack out the sulphur, bring it up to the top and fill their sledges. As soon as the sledges are full, they take them back down the side of the volcano. The sulphur is then weighed and they are paid according to the weight – around £4-£6 a day. The fitter amongst them start back up the volcano again to repeat the process. Life is gruelling and most miners only live to about 40 years old. If you want to book a guide before you go, check out these tours with GetYourGuide. Booking with GetYourGuide allows you to travel knowing that your tours are all sorted.